The company is set to report first quarter earnings after the closing bell on Tuesday. Earnings are expected to decline by 11% from the first quarter of 2018. The stock has moved above a downward sloped trend line since its last earnings report. Sentiment toward the stock has shifted slightly in recent months, moving away from the extremely optimistic levels seen before previous reports. I have heard hosts and other guests use the term “earnings recession” several times since then, and it fits with my concern about the coming earnings season. There are a number of companies that are expected to see earnings decline on a year-over-year basis and there are even more that are expected to see their earnings growth rates slow considerably. Netflix (NFLX) is one company that is expected to see its earnings decline. Analysts expect the company to report earnings of $0.57 per share on revenue of $4.44 billion. The company earned $0.64 in the first quarter of 2018, meaning analysts are expecting a decline of 10.9% on the EPS numbers. Netflix is set to release first quarter earnings after the close on April 16. The company saw the EPS decline by 27% in the fourth quarter while sales were up 27%. Analysts expect sales to grow by 21.6% in the first quarter. Over the last three years, Netflix saw its earnings grow by an average of 140% per year, so we are seeing a tremendous slowdown in the EPS growth. Analysts do expect the EPS to grow by 51% for 2019 as a whole. Looking at the management efficiency measurements, Netflix shows a return on equity of 27.5% and that is above average. However, the profit margin is only 7.8% and that is below average. This is the third time I have written about Netflix and an impending earnings report. As important as earnings and sales growth are, a key statistic for the company is the subscriber growth. Netflix told investors in January that it expected total subscribership of approximately 148.2 million at the end of the first quarter. According to Barron’s that would mean subscriber growth of 8.9 million. Since its last earnings report, Netflix has lagged the overall market, gaining only 3.26% while the S&P gained 9.19% from January 17 through April 9. When I wrote about the stock back in January, I suggested that investors wait until after the earnings report to buy the stock if indeed they were looking to add it to their portfolio. The stock did fall from $353.19 to $321.99 in the three days following the earnings report and then the stock rallied back up above $375 in the next two months. 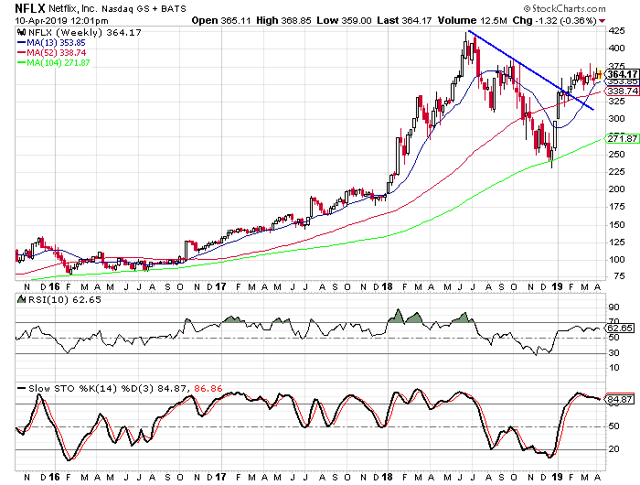 What we see on the weekly chart now is that the stock has consolidated between $350 and $375 for the last few months. While the stock hasn’t set the world on fire since the last earnings report, it did manage to move above the downward-sloped trend line that connected the highs from last July and October. It didn’t exactly break out once it moved above this trend line, but at least it moved above it. The stock is in overbought territory based on the weekly stochastic readings and the 10-week RSI is close to overbought territory, but hasn’t quite gotten to the 70 level. You can see on the chart that the stock spent prolonged periods with the stochastic readings in overbought territory during 2017 and 2018 before falling to oversold territory in the second half of 2018. Turning our attention to the sentiment indicators, we see that there has been a slight shift toward a more pessimistic stance, or at least a less bullish stance. The analysts’ ratings show that there are 44 analysts following the stock with 29 “buy” ratings, 12 “hold” ratings, and three “sell” ratings. In the table below, we see that the buy ratings have changed very little, but there are two more “sell” ratings than there were three months ago. This isn’t a huge shift, but a slightly less bullish stance as a whole. 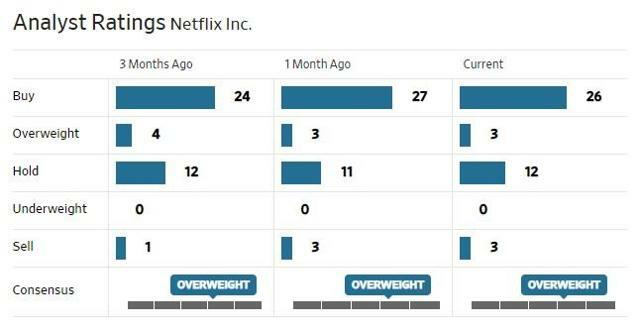 The short interest ratio for Netflix currently stands at 2.01 and that is up from 1.01 on January 15 when the last earnings report was released. The total number of shares sold short has declined since mid-January, but the ratio has increased because the average daily trading volume has declined from 15.8 million shares to 7.6 million shares. The put/call ratio is currently at 1.02, after eliminating the options that expire on April 12 since those will have expired before the earnings report is released. There are 230,705 puts open and 225,526 calls open. Looking back at my article from January, the put/call ratio was at 1.14 and I noted that the ratio was much higher than it was last July when it was only at 0.50. Something that jumps out now is that the put open interest was at 391K in January and the call open interest was at 341K. With the drop in average daily trading volume, I looked at how the total open interest compared to January. The total open interest, puts and calls, represented 73.3 million shares in January and that equated to 4.64 days of average volume. The put open interest represented 2.48 days. The total open interest now represents 45.5 million shares and that equates to 6 days of average volume. The put open interest represents 3.04 days of average volume. All in all, the sentiment has shifted slightly and isn’t nearly as bullish as it was in January. From a contrarian perspective, this could be a good thing for the stock. 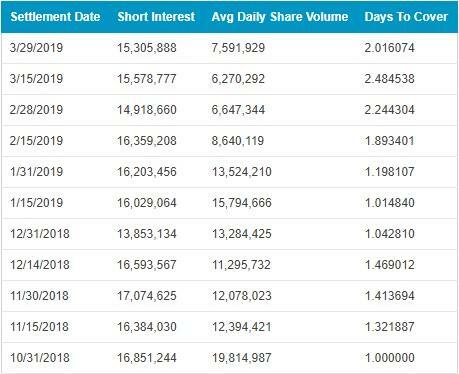 There are two more sell ratings from analysts, the short interest ratio has doubled, and the number of days to cover the put open interest has increased. The fundamentals for Netflix aren’t as strong as they were last July. One of the attractions for the stock last July was the fundamental readings. The stock got a 97 EPS rating from Investor’s Business Daily in July and that rating has dropped to 82. The SMR rating from IBD was an A back in July and now it is a B. From a technical perspective, there are positives and negatives in my book. The fact that the stock has moved above the downward-sloped trend line is a positive, but the fact that the stock is in overbought territory is a slight negative. As I expressed before, the stock has been known to remain in overbought territory for long periods of time, but that was when the fundamentals were better. The shift in the sentiment is encouraging from a contrarian perspective. When I wrote about Netflix back in July, I thought the strong fundamentals and the momentum the stock had would be enough to overcome the extreme optimism being displayed toward the stock. I was definitely wrong in that instance. Now the sentiment has shifted to a less bullish posture, but it isn’t exactly showing extreme pessimism toward the stock either. Given the overall picture, I would consider myself neutral on Netflix at this time. The stock could break out of the current range after earnings, but it could break in either direction. I expressed earlier that I have been concerned about the upcoming earnings season and the possibility of earnings declining. I’m not sure investors have prepared themselves for lower earnings. With Netflix, the direction of the initial move seems to depend on the new subscriber numbers. If the company can exceed the 8.9 million new subscriber mark, the stock should break above the $375 mark, but there is still resistance at the all-time high at $425. If the company disappoints on the new subscribers, I look for the stock to break below the $350 level. One new intermediate to long-term stock or ETF recommendation per week. One or two option recommendations per month. Bullish and bearish recommendations to help you weather different market conditions. A weekly update with my views on the market, events to keep an eye on, and updates on active recommendations.